Snail mail is dead--or is it? While most Chinese people prefer to use email or messaging apps like WeChat to communicate, there are still plenty of reasons you might want to flex your Chinese language skills by sending a letter. Maybe you have a friend studying abroad or a Chinese penpal (笔友, bǐyǒu). Maybe you need to return something you bought online. Maybe you just can’t say no to a pretty postcard (明信片, míngxìnpiàn), like more than one person here at Cheng & Tsui. Using the Chinese postal system can seem like a daunting task--even for advanced students of Chinese. Fortunately, half the difficulty lies in knowing how to address letters in Chinese, and we’re here to walk you through that process. Sending mail to Mainland China and Taiwan from the US can seem tricky at first. You may be asking: Should you address the letter in English so that your friendly neighborhood postal worker can read it, or in Chinese for the Chinese-speaking postal worker on the other side of the world? Fortunately, as long as you write the destination territory in English, you can write the rest of the recipient’s address in English, Chinese, or both. That’s because the United States Postal Service only delivers your letter to depots in Mainland China or Taiwan. In Mainland China, the China Post (中国邮政，Zhōngguó yóuzhèng) takes charge of your letters, and in Taiwan they are handled by Chunghwa Post (中華郵政, Zhōnghuá yóuzhèng). Since these postal services process international mail using computers, letters addressed entirely in English can be delivered, but they do sometimes get lost. Since your letter will be delivered by a Chinese speaker, your best bet is to write “P.R. China” (or “R.O.C. Taiwan”) in English, followed by the recipient’s address in Chinese, with the recipient’s address in English written below or to the right. No matter what you want to send or where you want to send it, you’ll need to know how to write addresses (地址, dìzhǐ) in Chinese. 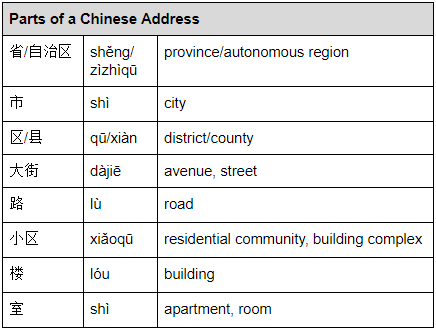 Unlike addresses written in English, addresses written in Chinese begin with the largest geographic component (usually the province) and end with the smallest. It’s important to note that not every Chinese address will contain all the parts mentioned above. For example, Beijing, Shanghai, Tianjin, and Chongqing are provincial-level municipalities (直辖市, zhíxiáshì), so you don’t need to list the province for an address located in one of those cities. There are also five provincial-level autonomous regions in China: Guangxi, Inner Mongolia, Ningxia, Tibet, and Xinjiang. When writing an address located in one of those regions, you should use 自治区 (zìzhìqū) in place of 省 (shěng). It might seem strange that districts (区 qū) and counties (县 xiàn) are smaller administrative units than cities, but remember that most Chinese cities are really, really big. Districts are located in urban areas, while counties are located in rural areas. Because districts rank slightly higher in the general administrative hierarchy of Mainland China, some counties have petitioned to change their status to districts! 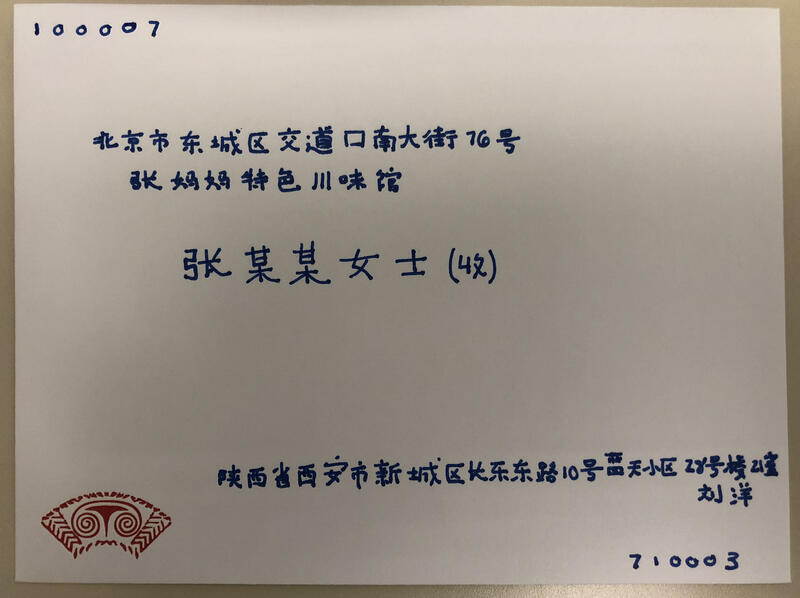 That second address belongs to Zhang Mama’s Sichuan Restaurant (张妈妈特色川味馆, Zhāng māmā tèsè chuān wèi guǎn), AKA the best Sichuan restaurant in Beijing. 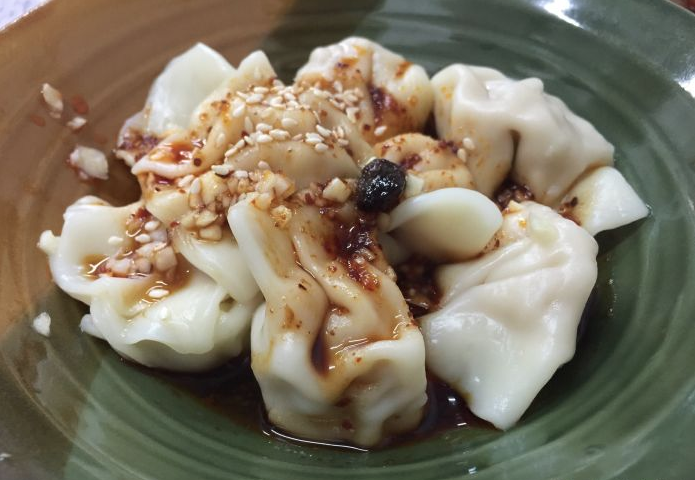 Let’s say you wanted to write a letter to the owner, to tell her how much you miss her 红油水饺 (hóng yóu shui jiǎo, chili oil dumplings) ever since you moved away (this is a purely hypothetical scenario, and is not at all a product of the blogger’s own wistful daydreaming of dumplings she has eaten). When addressing a letter in Chinese, you must write the recipient’s full name, and it is polite to use his or her title. You can use their job title or a generic title like 先生 (xiānshēng, Mr.) or 女士 (nǚshì, Ms.). You should indicate the intended recipient of the letter by writing 收 (shōu, to receive) in parentheses after his or her name. If you are sending a letter to someone’s work address, it’s a good idea to write the name of the business or organization, too. Writing the recipient and sender’s addresses in the correct spots on the envelope is crucial. Otherwise, your letter won’t get where it needs to go. In mainland China, mail is sent using horizontal envelopes. The proper placement of the recipient and sender’s addresses on an envelope is shown below. 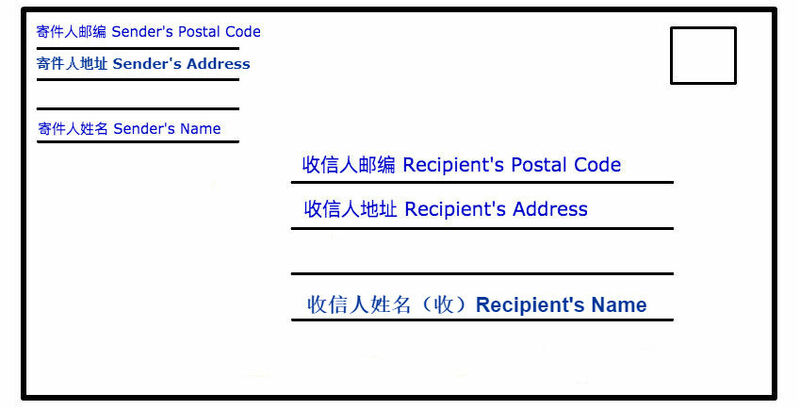 First and foremost, the recipient’s postal code (邮编，yóubiān) goes in the top left corner of the envelope. Mainland China uses six digit codes. The recipient’s address goes in the top left of the envelope beneath the postal code. If the address is long, it’s sometimes split into two lines. The name of the recipient’s company or organization can also go on the second line. The recipient’s name goes in the center of the envelope, beneath his or her address. The sender’s address and name go in the bottom right corner of the envelope. These are usually written on one line, unless the sender’s address is really long. The person who writes the letter can indicate he or she is the sender by writing 寄 (jì, to send) in parentheses after his or her name. Finally, the sender’s postal code goes in the bottom right corner. 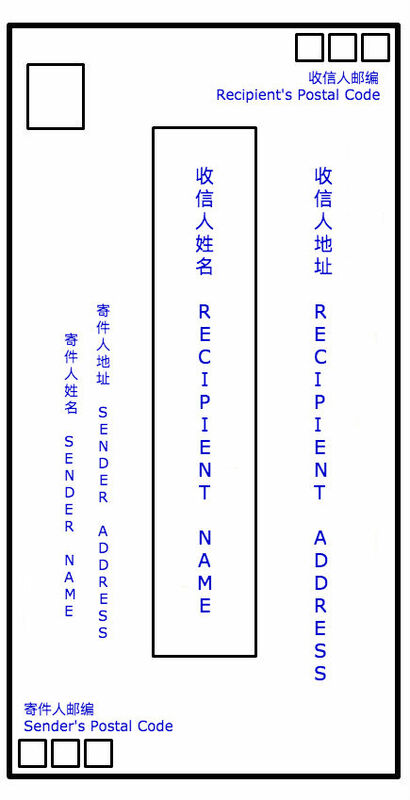 In Taiwan, there are two types of standard envelopes in use: horizontal and vertical envelopes. 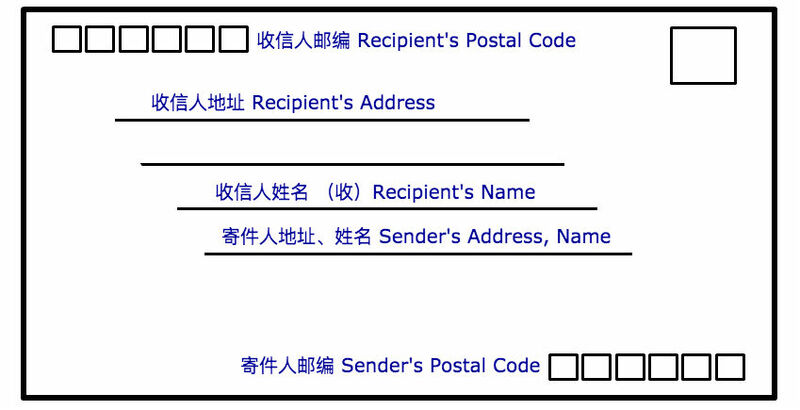 The proper placement of the recipient and sender’s addresses on a Taiwanese horizontal envelope is slightly different from mainland China’s, as shown below. The recipient’s address and name go in the center of the envelope. The three-digit postal code comes first, followed on the next two lines by the rest of the address. The recipient’s name is written beneath his or her address, with (收) written after it. The sender’s information is written in the exact same format (postal code, address, name) in the top left corner of the envelope, just in smaller characters. 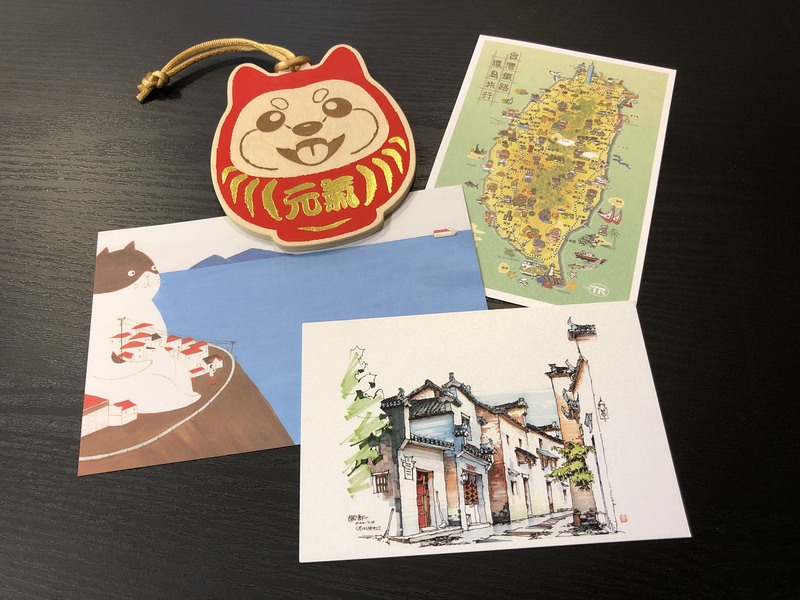 Don’t forget to use traditional characters when sending a letter to Taiwan! On a vertical envelope, the recipient’s name is written vertically in the box in the center of the envelope. The recipient’s postal code goes in the top right corner, and his or her address goes on the right side of the envelope. The sender’s postal code goes in the bottom left corner, and his or her name and address are written vertically on the left side of the envelope. Don’t worry--unless you live in Taiwan and send or receive a lot of letters, you probably won’t see this type of vertical envelope very often. 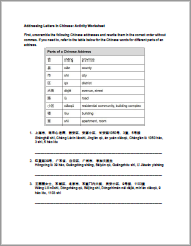 For more practice addressing letters in Chinese, download this free activity worksheet. © 2018 Cheng & Tsui Company, Inc. All rights reserved.